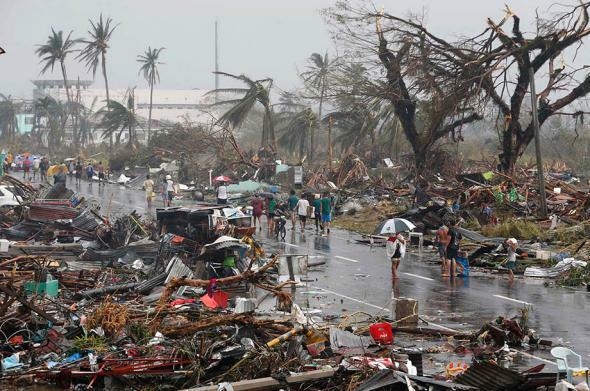 UPDATE: Supertyphoons and Global Warming. Residents walk on a road littered with debris after Super Typhoon Haiyan battered Tacloban city in central Philippines Nov. 10, 2013. Earlier today, I posted an article about how — and even if — global warming is currently affecting the formation, development, and strength of tropical cyclones (hurricanes and typhoons). My conclusion, based on what I had I read (including the International Panel on Climate Change’s latest Assessment Report), was that in the future global warming will certainly have a profound effect, but the signal of global warming was too weak to see in cyclones today. Well, that latter part turns out not be the case. That seems pretty clear*. They found that in the strongest cyclones, the maximum wind speeds have risen by about 29 kilometers per hour (18 mph) over the period of 1981 – 2006, a substantial amount. They found this was true of cyclones that occur nearly all over the world, and they found that this trend of increasing maximum wind speed is correlated with surface sea temperatures. They also found that an increase of 1° C in surface sea temperatures corresponds to an increase in the number of strong cyclones by as much as 30 percent per year. Note that it doesn’t increase the total number of cyclones; it only makes the strongest ones stronger. As I said in the earlier post, there are many factors in the growth of a cyclone, but the most important overall is water temperature; this is the main fuel for a cyclone. Correlation does not mean causation, of course, but warmer waters generating stronger cyclones is a fundamental aspect of cyclone physics. It makes sense to think that if the water temperature goes up, this will affect the maximum wind speed of a cyclone, and this is what those researchers found. I’ll note that there are a thousand aggravating details here. For example, as I mentioned in the earlier post, wind shear can cap the rising air in a cyclone, choking it off, preventing a full-blown tropical cyclone from forming — this is one reason we’ve seen fewer hurricanes in the Atlantic this season. Global warming affects all the parts of our incredibly complex climate system, so it’s entirely possible that as the Earth (and the oceans) warm, some factors that help stunt cyclones’ growth will increase, as well as ones that help feed them and make them grow. However, as this paper shows, all things being equal, warming water means stronger cyclones at the top of the scale. And most importantly, they see this trend right now. Today. So why didn’t the IPCC AR5 report talk about this? By its nature, the IPCC is very conservative, trying not to overreach in its conclusions. However, it has come under fire by many climatologists for being too conservative. I can understand that, since many times the estimates of future effects of global warming listed in previous reports have turned out to be underestimates. In other words, some of the actual effects of global warming have been worse (or at the top end of the scale) than what the IPCC has predicted. So my own article on this, concluding that global warming’s footprint may be too weak to see currently, looks to have been too conservative as well. Apparently, global warming is affecting cyclones, making the strongest ones stronger. Can we then conclude Haiyan turned into the monster it was due to global warming? As I said in the other article, no. What global warming does is create conditions that potentially allow strong cyclones to grow even more in strength. Any given cyclone may grow or die due to many other factors. But, given enough cyclones, the trend is clear. The dice are loaded, and we’re betting against the house. * In a follow-up paper, the authors give more details where they looked at a range of time from 1943 - 2008. They also answer some questions from critics of their work. It’s a fascinating read.